10. Salzburg Art Project | Kowanz, Wakolbinger, Wurm | Stiftung für Kunst und Kultur e.V. Based in Vienna, the artist Brigitte Kowanz (*1957) became known for her light installations which she executes in the form of spatial scenarios or as architectural “interventions”. Since 1997 she has been engaged as professor at the University of Applied Arts in Vienna. In her project entitled “Beyond Recall” for the Salzburg Staatsbrücke (or State Bridge), she has intervened in the structure’s architecture judiciously and strikingly in equal measure. Over the bases of the four bridgeheads Kowanz has erected semi-transparent mirror-faced cubes containing neon-lit lettering. “These illuminated characters between the mirrors are simultaneously space-forming elements and information carriers. The space created is without boundaries. Interior and exterior space coalesce. 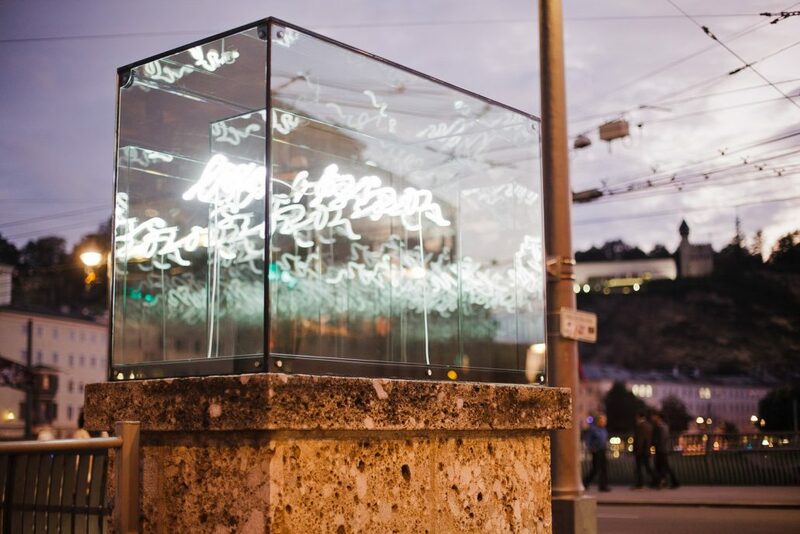 A simultaneity of space and time, lettering, image and sculpture is generated which can be experienced on a sensuous level”, explains the artist. The photographer and sculptor Manfred Wakolbinger (*1952) occupies space with his organically-curved objects, which appear as beings from another world. His large-format sculptures made of stainless steel are initially designed on the computer before being executed sculpturally. 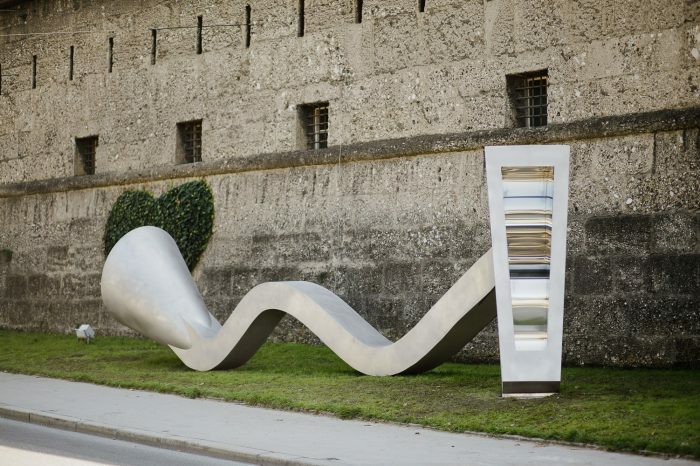 For the Salzburg Art Project Wakolbinger chose a site on the Rudolfskai, a quay between the old city wall and the River Salzach, which he conceives as a stage for his approximately 11-metre-long sculpture “Connection”, which references the cultural self-identity of the city of Salzburg. Erwin Wurm (*1954) is the master of biting, off-beat humour. With his hallmark wit and irony, the artist retraces social and civilizational developments and, in so doing, interrogates the conventional concept of sculpture. 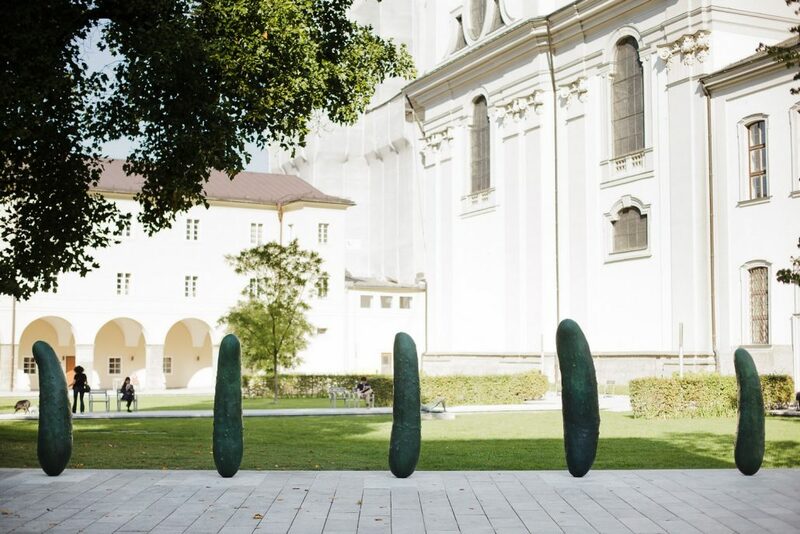 The essential point of reference in Wurm’s oeuvre – as evidenced, for example, in his work “Gurken” (or cucumbers), which he is planning to install nearby the Furtwängler Park – is the human body, in all its multifaceted individuality.